If you have happened upon this blog and want a nice taste of what we are about, check out some of our reader’s favorite posts. These classic posts are interesting reads and deserve a place in our hall of fame. Don’t see your favorite posts here? Feel free to comment and make your suggestion. Purple Martin Fact vs Fiction A great basic rundown for the newbie that dispells some of the misconceptions and outright lies meant to separate you from your hard earned dollar. A must read for the newbie. 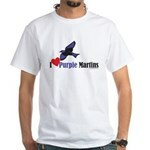 How Can I Get That New Martin System A comical look at the things we do to get more purple martins. Accidental Birding at a Purple Martin Colony Purple Martins may be my passion but birding opportunities are ever present in any backyard. Purple Martin Roost Includes a short video captured in Davie Florida, of a premigratory roost. Thousands of birds descend in a show only mother nature could orchestrate. Martin Down! The predation at a roost by cats and raccoons. Great photos and an injured martin recovered and saved from being eaten alive. An Afternoon With Jose One of a few posts I wrote after meeting an elderly gentleman called Jose (Joe) in a nursing home. His accounts of being a purple martin landlord many years ago is sweet and touching. Switching Martins from Round Entrances to SREH How to switch compartment entrances from round to starling resistant to protect your martins from the threat of starlings. Is It A Sparrow? A must read for those who have questions on what a sparrow actually is. There are lots of small brown birds that are native that can be confused with the English House Sparrow (invasive and not native) Learn the difference. Serious Hosp Control House Sparrows (Hosp) can and will enter the nest while the parents are feeding and kill martin nestlings and even pierce the eggs so they do not hatch. Don’t be fooled by their small size. The danger is great. Read about how to control these invasive and non native birds here. Snake In The Gourd A must read for those that think that snakes won’t climb a pole. Pictures and the deadly aftermath of a snake attack. Owl Protection Owls can devastate a colony and you wouldn’t even know until your colony is gone. Read some helpful hints to prevent this tragedy. Purple Martins Feeling Louse-y Bird lice are just some of the creepy crawlies you may encounter as a purple martin landlord. Read about the little nasties and how to treat. Supplemental Feeding of Adult Purple Martins Covers the importance of providing supplemental feedings to purple martins in extended periods of cold, wind or rain as only 2-3 days of adverse weather can prove fatal to purple martins who rely on flying insects to survive.